Plus FREE or discounted zone shipping on orders over $1500! ** Free clear coat interior is not available for designer islands, designer vanities or drawer boxes. Our cabinet doors are as beautiful in appearance as they are in craftsmanship. We start with premium grades of 3/4" thick, solid maple, oak or cherry. Rails and stiles are all glued for superior strength. Our door panels actually float in the frames to accommodate seasonal humidity, ensuring a better fit and durability. 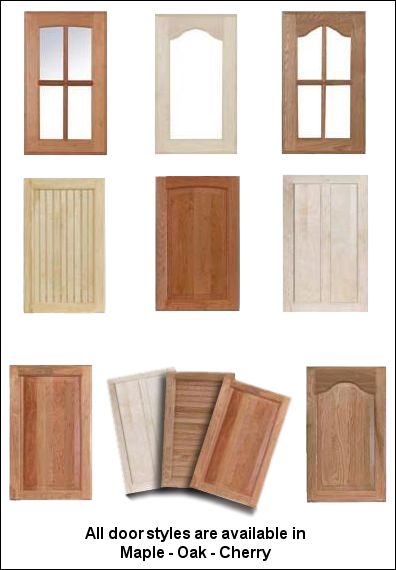 Whatever your home style is, you are sure to find a door style to complement your decor. A choice of three wood species, numerous door styles and an array of decorative hardware options ensure that you can create the look and feel you want.